Perfect little low histamine carrot cake bites. A quick and easy carrot cake flavored treat. Grate the carrots finely, place them in a foodprocessor. Grate the ginger very fine, or pass it through a garlic press (which is what I do). Add the ginger to the carrots. Add all the remaining ingredients to the foodprocessor. And process until all ingredients has been fully incorporated and no big chunks of nuts are left. 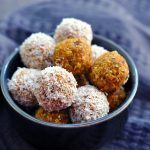 Use a tsp to scoop up small amounts of ‘dough’, roll them to little balls with your hands and roll them in desiccated coconut to cover or leave them bare. Place in the refrigerator to firm up a bit before sinking your teeth into them. Honestly I think they are best after a night in the fridge. You can adjust the sweetness by adding date more or less. if you don’t tolerate pecans, you can use macadamia nuts instead. However, these are a bit harder than pecans, and it is advisable to chop them up finely before adding them to the foodprocessor. If you don’t want to use fresh ginger, you can replace this with ca. 1/4 tsp of dried grounded ginger. You can of course also add some cinnamon, if you tolerate it. Estimated nutrition information is shown below. Note if you use the acacia fibers, they are higher in fiber than what’s estimated.